Star Wars #37 marks Jason Aaron’s last issue on the Star Wars ongoing series as Kieron Gillen will be taking over from here. It also marks the return of Scar Squadron. I have to tip my hat to Aaron for making a very bold move in this issue. Rather than having Scar Squadron go out with a bang and getting wiped out by the Rebels, he gives them a triumphant victory, and dark ending for the heroes. While Luke, Han and Leia live, the’re left to bury the dead. The story starts with Sergeant Kreel doing some lightsaber training. However, things really get interesting when Vader interrupts him. With some smart dialog, Kreel avoids being murdered by the Dark Lord of the Sith, and he manages to keep his lightsaber. He even gets to meet Palpatine. From there, the story takes a time jump as Scar Squadron heads to the Horox System to hunt down some Rebels. They liberate a village from a local tyrant, which is a nice little plug for the evil Empire actually doing some good, then they find the Rebels and wipe them out. The battle against the Rebels focuses on Kreel and his internal thoughts. It shows his belief in the Empire and what they’re doing, his dedication to their cause, and his commitment to honor Lord Vader and Emperor Palpatine. Suffice to say, there’s some lightsaber action. The story ends with an equally interesting turn. There is no Rebel victory. Scar Squadron wins. They wipe out the Rebels and leave only the dead. Han, Leia and Luke show up afterwards to see the end result of the carnage. It’s a dark ending as they are left to take care of the dead bodies. Out there somewhere is Scar Squadron. And maybe some day we’ll see them again. It’s a solid story with some nice artwork, and a good way for Aaron to leave the series. But that’s not the end of it, as there’s one more story squeezed into this issue. “The Sand Will Provide” is a bit of a bonus story included in Star Wars #37 that’s co-written by Jason Aaron’s son, Dash. It takes place on Tatooine and focuses on the Tusken Raiders. The artwork is by Andrea Sorrentino and Lee Loughridge, and it’s gorgeous. They story is poignant and has a nice ending. 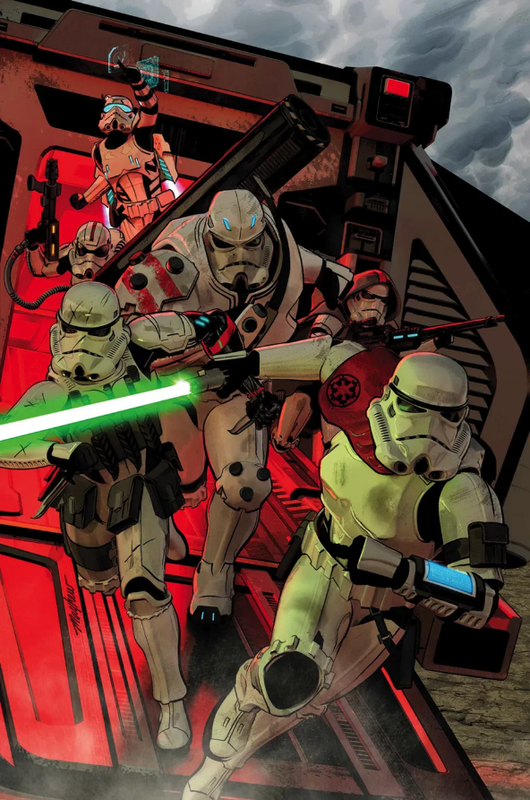 If the Scar Squadron story was dark, this one provides some light to balance things out. Together, it makes a great stand alone issue that all fans can enjoy. I highly recommend this one and give it a five out of five metal bikinis.